Frank Leblanc, 62, from Nantes, said: "It was hot wind. It was useless and it didn't achieve anything. We're here to show Macron that empty words are not enough." Francine Sevigny, from Lyon, said: "It's bigger today because we're marking the end of the big debate. All of the yellow vests in France were called to Paris today... Macron has given us no big solutions in the big debate." Marie, a mother of two from Seine-et-Marne who wouldn't give her surname, said: "I'm glad there are the thugs, because without them our movement wouldn't get any attention. We need the violence so we can be heard." Saturday's protests saw more than 100 people arrested amid rioting in the capital. Macron had led the national debate to respond to protesters' concerns about sinking living standards, stagnant wages and high unemployment. French firefighters are working to extinguish a blaze in a Paris restaurant seen as a powerful symbol of France's elite that was set amid yellow vest protest violence. 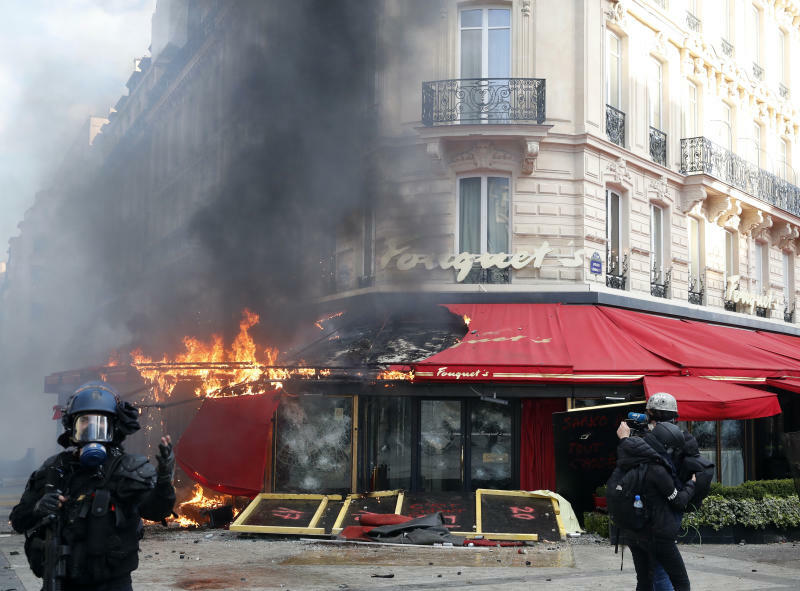 The flames pouring out of the posh eatery Fouquet's on the Champs-Elysees marked one of the most powerful images on a day of unusual unrest in the French capital. The restaurant was vandalized Saturday morning and later set ablaze. Several luxury boutiques along the elegant avenue were also ransacked, and kiosks set on fire. Fouquet's is popular among celebrities and powerbrokers. Critics see the place as an offensive example of bourgeois decadence that is inaccessible to most French people, who are struggling to pay their bills. It's also associated with former conservative President Nicolas Sarkozy, who celebrated his 2007 election victory in Fouquet's — drawing criticism for his choice of such a flashy locale. French Prime Minister Edouard Philippe is vowing to "severely punish" the radicals responsible for rioting and setting fires around one of France's richest neighborhoods. He estimated up to a few thousand troublemakers were responsible for Saturday's "unacceptable" violence. Speaking to reporters, he praised firefighters who saved people trapped in a building set fire by protesters. Armored vehicles and about 15 police vans are lined up at one spot, facing down a mixture of yellow-vested protesters and black-clad people who seemed to be seeking opportunities to target police. Florian Lointier, spokesman for Paris' firefighters, told The Associated Press that 11 people sustained light injuries Saturday in the blaze, including two firefighters. French yellow vest protesters are rioting in a 18th straight weekend of demonstrations against President Emmanuel Macron. 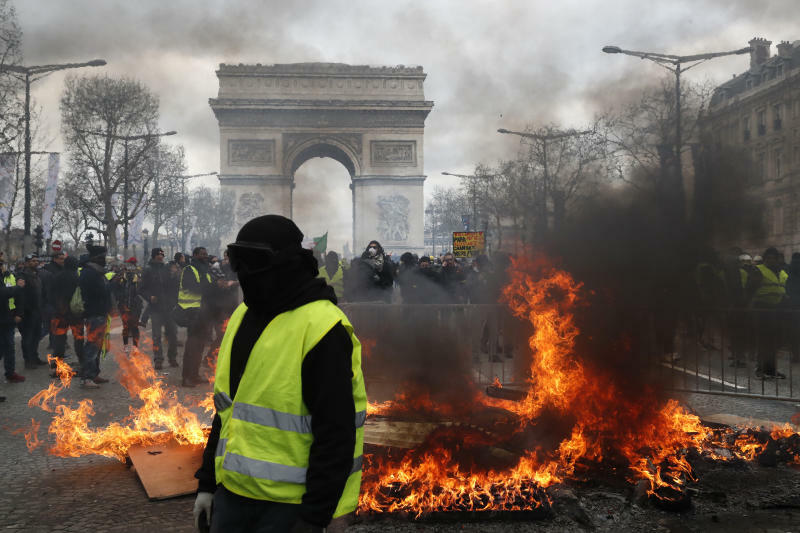 Large plumes of smoke are rising above Paris' landmark Champs-Elysees avenue as French yellow vest protesters set life-threatening fires, smashed up luxury stores and clashed with police in a 18th straight weekend of demonstrations against President Emmanuel Macron. Police tried to contain the demonstrators Saturday with tear gas and water cannons. Fire trucks rushed and extinguished two burning newspaper kiosks that had been set ablaze. Several protesters posed for a photo in front of a kiosk's charred remains. 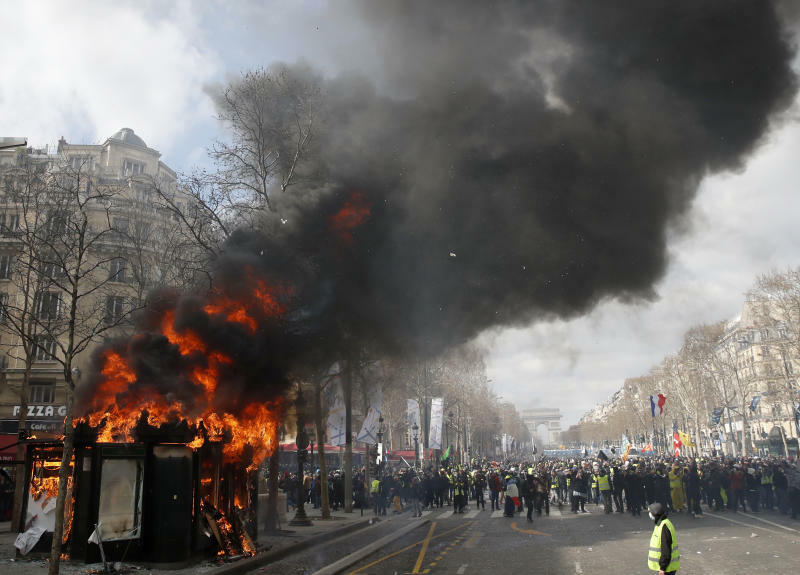 The violence comes after a two-month national debate that Macron organized to respond to protesters' concerns about sinking living standards, high unemployment, stagnant wages and general income inequality.